Easter is a wonderful time to get the kids involved in crafts, whatever the holiday means to you. 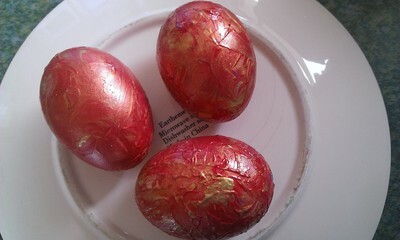 These pretty eggs are easy and fun to do and very effective. Use your favourite colours (we used red, gold and blue sparkles), let them dry and then put them on display. Your kids will be so proud of what they've achieved. Pierce a hole in each end of your egg, hold over a bowl and blow. It helps to make the hole of the bottom bigger (about 1/2 the size of your little finger nail). Wash the eggs thoroughly and leave to dry. In the meantime whip up an omelette and have a snack. 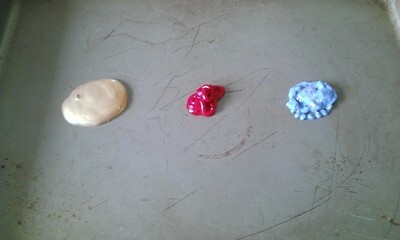 Once your eggs are dry, squirt three large blobs of paint into your baking tray. 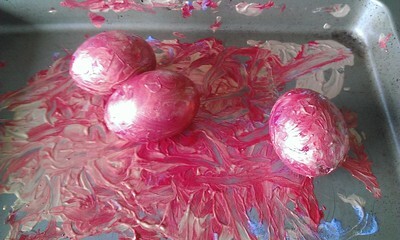 Put your eggs into the tray and tip the tray to roll them through the paint. If your paint is a bit thick and they stick, bat them around gently with your hand (my kids love this bit). Continue until they're well covered. Leave on an upturned saucer to dry, turning once when the top is dry to the touch so that the bottom can dry. 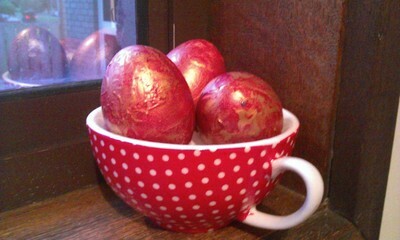 Once dry, put your eggs on display in a nest, on a shelf or - like us - in a large teacup. Enjoy.